It must have come as a surprise to early pioneers in the area northwest of present-day Washington, DC—where the Potomac River is mostly calm, wide, and still—to find a sudden, powerful plunge impassable by boat. 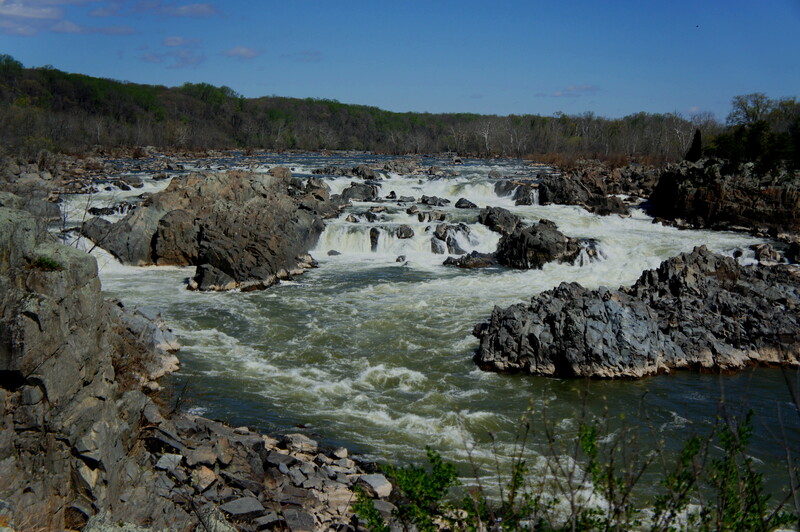 Owing to a geomorphologic break extending 900 miles along the Eastern Seaboard, Great Falls tumbles 76 feet in less than a mile; today its most dramatic section can be viewed from three overlooks in northern Virginia’s Great Falls Park, managed since 1966 by the National Park Service. 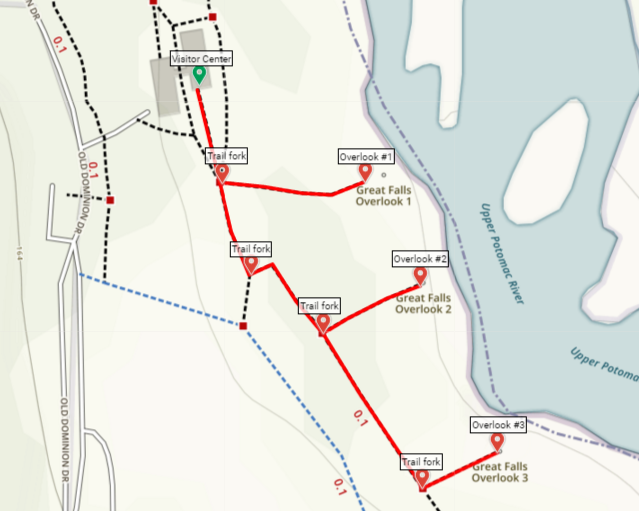 The Visitor Center serves as the locus of activity for Great Falls Park and is the best starting point for this short jaunt to the three overlooks. Parking spots are aplenty, but arriving on a nice weekend afternoon may relegate you to the north lot, situated 1/3 mile up the road. After checking out the exhibits at the extensive Visitor Center, head back outdoors and bear south on the paved path leading to the large, grassy picnic area. Take the first left—effectively at the foot of the ramp leaving the Visitor Center—to visit Overlook #1. The sole viewpoint that is not wheelchair-friendly, the overlook is accessed by way of a dusty downhill path descending through the trees. Overlook #1 is also the closest of the three to the heart of the falls. Peering over the railing, the gorge drops dozens of feet to the riotous river. In the foreground, a thunderous cascade separates the canyon wall from a rocky island; in the background, dozens of other chutes are busy slowly grinding away at the bedrock. 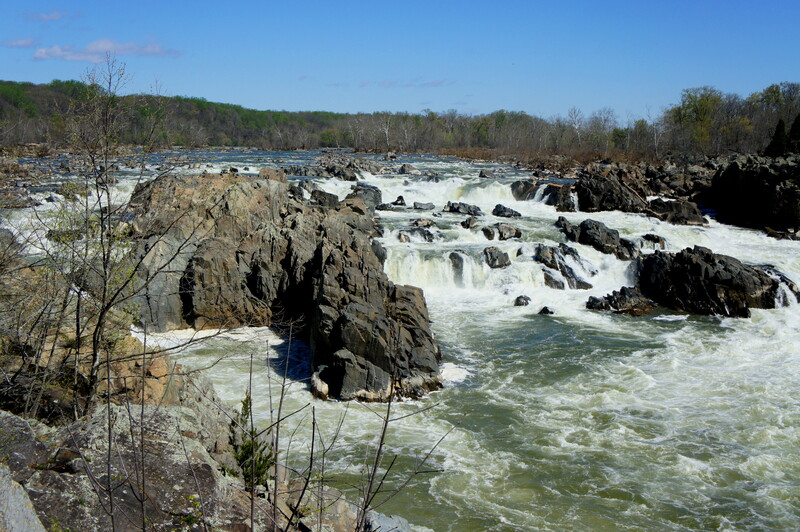 Great Falls is situated along a fall line, meaning a break between an upland area composed of harder metamorphic rock and lower coastal plain made of softer sedimentary rock. 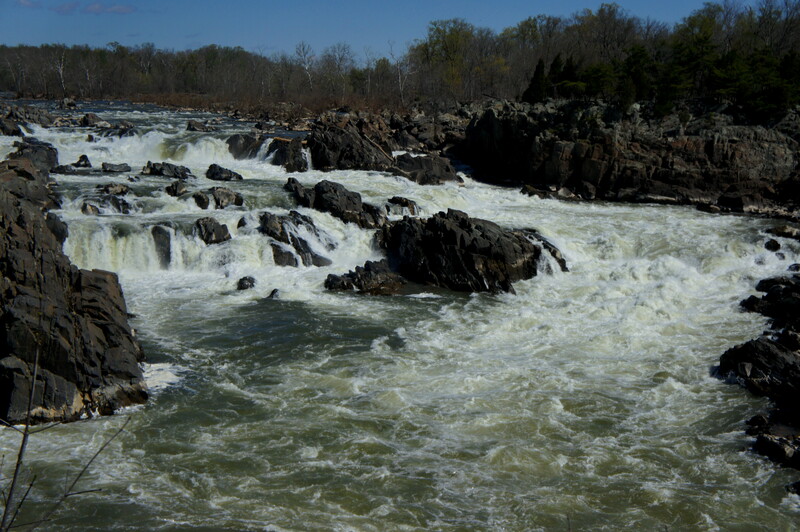 Here the Potomac River drives the erosion of the sedimentary rock in hyper speed—by geological standards—leaving a hardened bedrock of schist and meta-graywacke and, of course, a set of rugged cascades. Across the river is Maryland and Olmsted Island, where another visitor platform is visible, offering views from the eastern bank. Returning to the Visitor Center, bear left on the paved trail, then turn left again, crossing a short wooden bridge and passing an interpretive map and sign about the Potomac Gorge area. The next spur trail on the left leads to Overlook #2, passing first an interesting landmark: a wooden marker with six dates, recording the high water marks for the past century’s six largest floods in the area. The most overwhelming was the Pittsburgh Flood of 1936, Great Falls’ highest on record. Overlook #2 is more removed from the falls but offers a sweeping picture; it also provides an excellent view of the whitewater channel winding around the outermost section of the falls, on the Maryland side. Allot at least 20-30 minutes to take in the three overlooks. 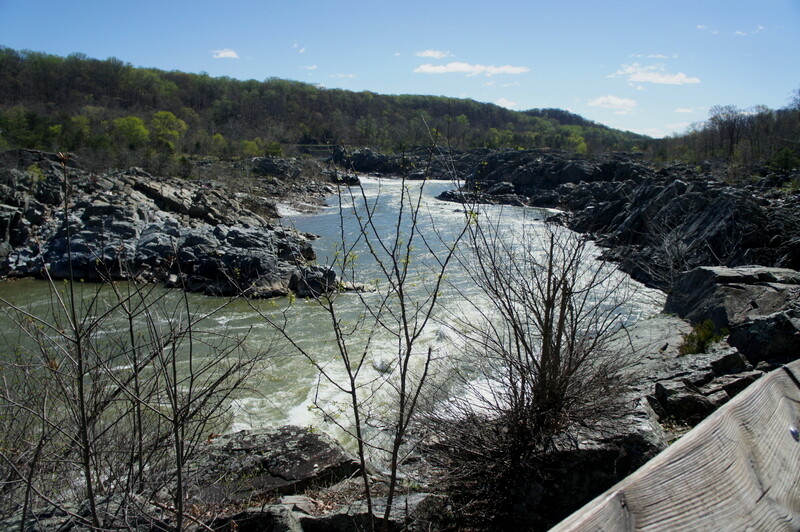 This entry was posted in Easy Hikes, Great Falls Park, Virginia and tagged canyon, Great Falls, Great Falls overlooks, Great Falls Park, Mather Gorge, Potomac River, Virginia, waterfall, wheelchair-accessible. Bookmark the permalink. that is a big surprise in that area. A very nice surprise unless you are in a boat.